What Is Pronation And Suppination? OK, today I thought it might be useful to take a closer look at a common problem many hikers can experience when hiking on the trail. As noted on many occasions throughout the site, your hiking boots are a critical part of your hiking gear. I consider hiking boots to be a must have item for heading out on the trail and so taking time to find the perfect fit and get the right model for you, is a really wise idea. Nothing will ruin a hiker’s day faster than a pinching blister or other sore coming from a pair of ill fitting boots. I have reviewed the key items for buying hiking boots in the hiking boot buying guide. In that I cover pretty much all the main things you need to be aware of when considering the purchase of a good pair of hiking boots. However, I thought it might be useful to start going into some elements within that sphere in a bit more detail. So today I want to hone in on two common problems that hikers, and folks in general, encounter when choosing boots and shoes. Let’s look at Pronation and Supination. What is Pronation and Supination? In a nutshell, they are the way your feet and ankles move and bend when you walk. Pronation is where your ankle bends inwards as you walk. Supination is where your ankle bends outwards as you walk. Pronation is, by my best estimation, the more common of the two. What’s the big deal about that? Well, as you can imagine, if you keep on walking for a long period of time with your ankle, or ankles, bending or leaning inward or outward, there will be significantly more stress on certain muscles and your ankle as a whole. The ankle is designed, if I can use that word, to be in a vertical and aligned position to the rest of your body. So, if you pronate or supinate as you walk, it follows that you can expect pain to develop over time. Now, some people will have pronation or supination to a greater or lesser degree. That is, many people in day-to-day life can just get on with things if they have only a little bit of pronation or suppination. This can be very deceptive though as all the time you walk on and don’t take remedial action, damage is quite possibly being done. So, something that is a minor annoyance can develop into a bigger problem over time. As a hiker, you of course are often moving your feet in various and different ways. For example, when you hike upwards over a rocky slope, your ankle will be under a lot more stress and strain than it normally would from just walking on a normal flat trail or road. So, hikers can be particularly prone to experience more pronounced problems with pronating or suppinating feet. How can I Tell if my Foot / Feet Pronate or Supinate? Well, this is pretty easy to do. A pronating foot can be recognized by excessive wear on the inside heel of a boot or shoe. A supinating foot can be recognized by excessive wear on the outside heel of a boot or shoe. So, go get a pair of boots or shoes you have worn for some time and take a look at the heel and you should be able to tell if your feet pronate or supinate. If you really have a bad problem with pronation and supination, you probably already know about it and have experienced pain or discomfort to some degree. That is, if it would cause you hassle hiking, when you are being a bit more various in terms of exertion on your feet and ankles, in all likelihood it has already caused you hassle in terms of walking around day to day. Now, it is worth noting that minor pronation or supination can cause little or no problem to people. It really depends on the individual as to what degree you may or may not experience problems. What can I do if my Feet Pronate or Supinate? So, you have to live with it but for most people this is more than manageable. Your first port of call could be specialized insoles which will help keep your feet in a certain position providing the required support that you need. 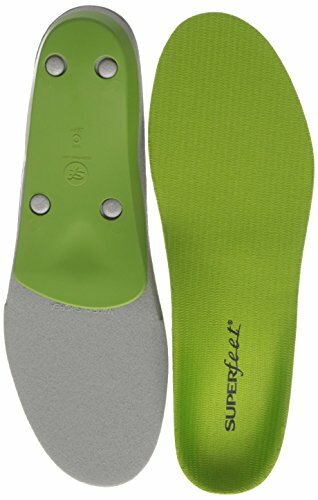 Now, I should stress that I’m no expert on this area as I thankfully don’t have any major pronation or supination issues but pictured below are a pair of insoles, called Superfeet Green Premium Insoles, that are along the lines to what I am referring to. Click on the image to learn more. Now, there are many different insole and heel support options available depending on the level of the problem you experience with either pronating or supinating feet. So, as with everything in terms of hiking gear, it’s worth researching those different options, reading user reviews and so on to see if they sound like the right ones for you. I think if your problem is minor to medium, you should be fine to try and find a solution yourself. Get some suitable insoles and try them out. If you notice a difference, happy days! If not, maybe try another type of insole and see if that works any better. If, however, you have a bigger problem and you suspect you might have a potentially high level or pronation or supination, you may need to make an appointment with a podiatrist or orthotist. A podiatrist is basically a specialist doctor that deals with all things related to the feet and ankles. They will be able to look at your problem and give you a good course of action. If you have a pronation or supination problem, you may also end up having some dealings with an orthotist. These guys are specialists in the prescription, manufacture and management of orthoses. An orthosis is something that is used to control, guide, limit and/or immobilize an extremity, joint or body segment for a particular reason. So, In layman terms, these guys measure your feet, your gait, your ankles, etc. and then, similar to our insoles above, they would design a specialized insole or prop specifically for you to support your ankle to counter the pronation or supination. Now, to the best of my knowledge, you can go straight to the orthotist to try and sort you out and skip the podiatrist but I’m not 100% sure. I think it really depends on the set-up where you are based and how bad your problem is. If it’s bad, it goes without saying that you should always seek medical advice first so if you just start with your local physician, they will advise you from there. So, there you have it. I hope found this brief look at pronation and supination useful. Today was just a short trip into a problem that can be a real pain, literally, for many people. For some, it’s an annoyance that can be accommodated with some insoles. For many, it’s a bigger problem where professional help is required. Each persons’ feet are unique so it follows that sometimes a very specific solution may be required to help address pronation or supination. If you have problems with standard boot sizes, you could also look into getting custom made hiking boots but that’s more for someone with general comfort issues or minor pronation / supination problems. For bigger problems, an orthotic of some kind will most likely need to be used in conjunction with a pair of hiking boots and / or normal day-to-day shoes. So, if you notice your ankles getting overly tired or sore after a hike, it will do no harm to take a quick look at an old pair of shoes and check where the wear and tear on the heel of them are. If there’s a noticeable wearing on the inside of the heel, you could have a higher than average level of pronation. If there is a noticeable wearing on the outside of the heel, you could have an issue with supination. Either way, if you’re concerned, discuss it with your physician to get some advice. 5 of the Most Common Hiking Injuries How To Choose The Best Insoles For Hiking Boots And Shoes Can You Wear Sneakers Hiking? Do The Tongues In Your Hiking Boots Slouch To The Side? Hiking Boots – Finding The Perfect Fit!